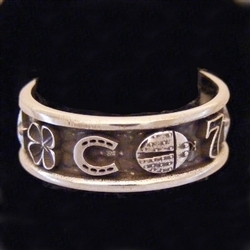 Band style ring with good luck symbols around it. This band is 6.5 mm wide. Sterling silver. Design Notes: I wanted to do a little band ring that was the ultimate good luck charm. So, this little band has a four-leaf clover, a horseshoe, a ladybug, the number 7 and a star.